One Lucky Day: Metallic Distress Paint - can't. get. enough. I didn't have an end result in mind when I started today (sometimes that's a good thing). I only knew I wanted to use more of that Distress Tarnished Brass Paint, because I love the shine! I also chose bright pink Distress Stain - Picked Raspberry to go with the gold...it was screaming, USE ME! from the shelf on the wall. So I did. 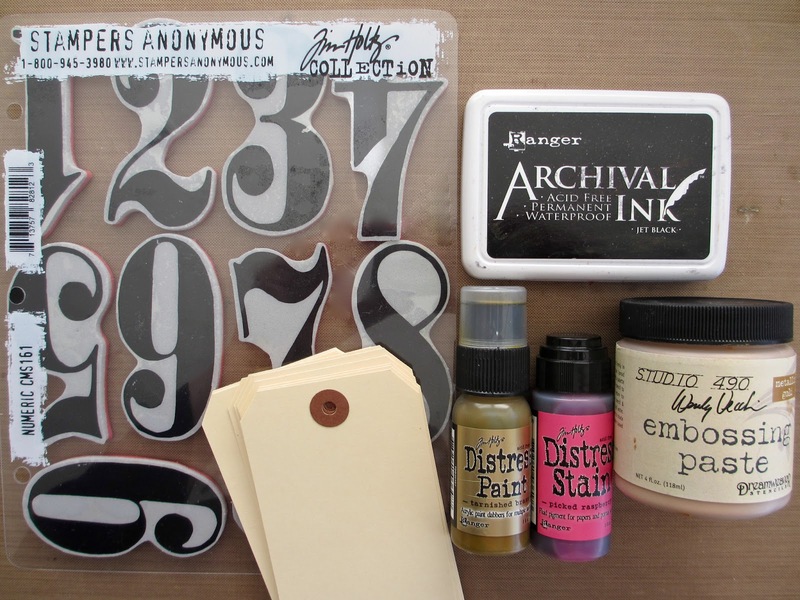 Add in the stamp set, Numeric, manila tags and GOLD Embossing Paste from Wendy Vecchi and I think we have something to work with. So lets get going. In the last post, I showed how I used the Union Jack flag to stamp to with silver Distress Paint. In today's post, I used the same resist technique using the Tarnished Brass and the number stamps, Numeric. One thing I wanted to point out is when you add the Distress Stain to the surface it will bead up on the painted portion just like it shows here. Once dry, the number still has some of the residual stain. Just rub over the paint with a baby wipe or paper towel and the stain rubs right off the painted portion. Another tip for cleaning the paint off the stamp: use a baby wipe. The last time, I sprayed the stamp with water and pouncing off on a paper towel. Using the baby wipe was easier and not nearly as messy as the water dripping everywhere. Okay, so I have all my tags done...I stamped the tags 1-10. Next, I stamped each tag with black archival ink and a flourish stamp from the Stamper Anonymous Shabby French set. Love how they look all together! To give the tags a bit more detail I used Wendy Vecchi's "Lovely Leaves" stencil leaf stencil and her gold Embossing Paste. I like that these stencils have a semi-transparent surface so I can see the flourish image below and know I am laying the stencil right where I want it. I will warn you, the embossing paste does not look gold when you open the jar or when you put it on. Just be patient and let it dry...it will surprise you how nice the gold color is, compared to how it started. Remember to clean your stencil and scraper immediately after use. 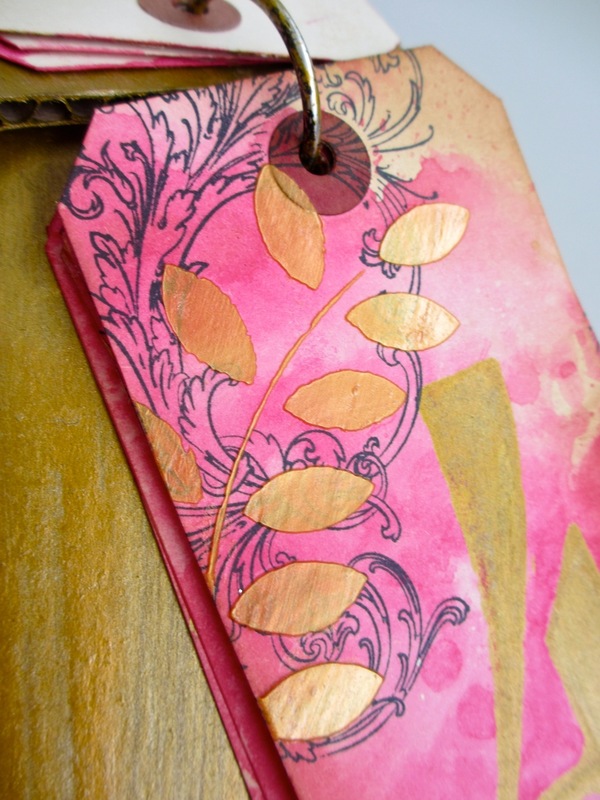 Set the tags aside to let the stenciled leaves dry. Man, they look good all together. I think I will add a little cover to the tag set. I was cleaning out a drawer the other day and came across some pieces of corrugated cardboard. I cut two pieces to fit the tag size, one for the front and one for the back. I peeled off the outside layer of paper on the front cover. Then colored the cover with Picked Raspberry using the dabber top. Note: I did put some of the stain onto the non stick mat and lay the cover into the stain just to get some varying degrees of the pink color. Next, I squeezed out some on Tarnished Brass paint (remember to shake it up first). Then ran all the edges of the cardboard through the paint. I tilted the cardboard forward so that the paint would go up onto the cover just a bit. Then, just as with the pink stain, I misted just a bit of water into the remaining paint and turned the cover over into it. Love how it looks like gold veining in rock. I quickly dried it with a Heat it tool so the paint would not just soak into the cardboard. Once dry, I painted the backside as well as the other piece of cardboard (for the back) with Tarnish Brass using the dabber tip. Okay, need some embellishment...must have metal! I chose an Ornate Plate for the job since it fit the cover perfectly. I randomly added some Tarnish Brass Distress Paint. If you get too much, just wipe some away. Dry with a Heat it tool just for a minute to start the drying process. I went back and added Black Soot Distress Paint over the top of the gold and dried it again. I added a cardstock piece with Remnant Rubs for the title. I thought this might be the perfect little book to record 10 "lucky" things. And really? how could I pass it up since it has such personal meaning? I decided I did not want the brad legs showing on the other side of the cover so I inserted the brads and just pushed the ends towards the center of the Ornate Plate. Then I glued the plate to the cover. I added a ring at the top to keep everything together. Now just to finish the pages with my thoughts...sounds like a good job to do on the weekend. I have to say, I love how one piece of cardboard can look so good and really make the whole project. Look how fabulous the gold Embossing Paste leaves turned out once dry...love that you can see the black stamping underneath. fab project! Love distress paints and embossing paste!!!!!Amazing! thanks Scrapthat...I will keep going then! OMG Paula what a fabulously gorgeous project - I need one of those! the pickled raspberry and tarnished brass go so well together. Beautiful! If you wanted the little bits of stain to stay, would they once dried? So gorgeous! You never fail to amaze me with your unique and creative combinations, Paula. I love every single thing about this! Gorgeous! 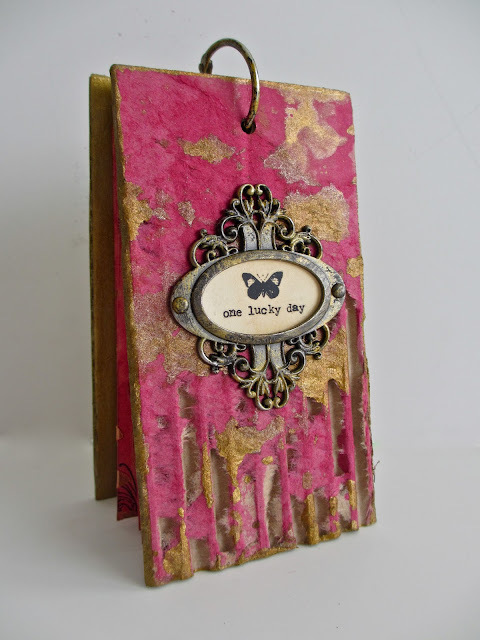 I love the color combo here and that gold embossing paste. So pretty. What a neat little book! Enjoying all your ideas with the metallic paints. Thanks so much for all the great ideas. I love following your blog and always look forward when you have a new post. Your projects are always amazing - love the color combination - and I love over sized numbers! Thanks for your constant inspiration! thanks connie...you are the best. Another Paula gorgeousamundo project! Lovin' that pink and tarnished brass. You rocked that... made it look simple LOL , yet so cool, fun techniques! Simple, but WOW. Love the Numeric stamps.....I want, I need, can I have? My list keeps growing and growing with each project you do. Do you ever sleep? Thanks for the inspiration! Super awesome project. I have that stamp set and have yet to use it but I LOVE it. Those leaves are beyond fab!! really pretty, what are you going to do with the book now??? right now Kristen I am still in the gathering stage. I have small instagram photos that I have sent for and am waiting for delivery. Beautifu and so awesome tags. Love them. Great techniques. TFS!!!! Just reading this post for the first time (thank you Pinterest poster!) and have to tell you I absolutely adore these tags, especially the colour combo! Thank you for sharing!